Christian McKay Heidicker draws inspiration from Bram Stoker, H. P. Lovecraft and Edgar Allen Poe for his debut middle-grade novel, a thrilling portrait of survival and an unforgettable tale of friendship. The haunted season has arrived in the Antler Wood. No fox kit is safe. When Mia and Uly are separated from their litters, they discover a dangerous world full of monsters. In order to find a den to call home, they must venture through field and forest, facing unspeakable things that dwell in the darkness: a zombie who hungers for their flesh, a witch who tries to steal their skins, a ghost who hunts them through the snow . . . and other things too scary to mention. 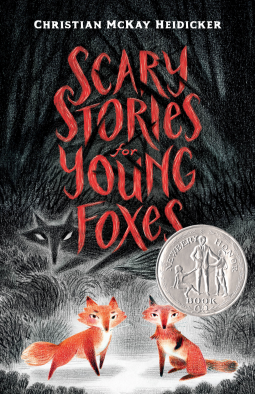 Featuring eight interconnected stories and sixteen hauntingly beautiful illustrations, Scary Stories for Young Foxes contains the kinds of adventures and thrills you love to listen to beside a campfire in the dark of night. Fans of Neil Gaiman, Jonathan Auxier, and R. L. Stine have found their next favorite book.